Science Careers is conducting a survey of postdoc supervisors to learn more about what makes for a successful postdoc experience and to explore industry trends. The overall results of this survey will be published in the 26 August 2011 issue of Science. If you supervise postdocs, would you please help us by taking our survey, which takes about 20 to 25 minutes to complete? In return, we'll enter your name in a drawing for one of 10 $50 Amazon gift certificates. All individual survey responses will be kept strictly confidential. In today's ScienceExpress, researchers led by J. Craig Venter report that they have built a genome from scratch and used it to control a cell. The breakthrough—$40 million and more than a decade in the making—is a critical milestone in the burgeoning field of synthetic genomics. But it also raises important scientific and ethical questions. JoVE, the first PubMed-indexed visualized methods journal, has published its 450th video article. We invite you to publish your experimental methods in our journal to join your colleagues from Harvard, MIT, Yale, Stanford, NIH and other leading institutions that previously published in JoVE. Our film professionals are ready to come to your lab and film your procedures - please reply to this email or visit instructions to authors if you are interested. Below are recently published articles in their respective fields. We have made them available to you without the need for a subscription. I hope that you find JoVE useful for your research and studies, and will consider publishing with us. If you do not want to receive emails from me in the future, please reply to this email and let me know or click here. be presented in a long course format. RU; M. EHRENBERG, University of Uppsala, SE; A. GRONENBORN, University of Pittsburgh, US; D.
FEE: 1,100 Euro. Fee includes full board and lodging at the Ettore Majorana Centre. education to higher education and adult learning. representatives of authorities and the education sector in Russia. Opening date for call is 22 October 2009. "how chromosomes are protected by telomeres and the enzyme telomerase"
The deadline for applications is March 15th, 2009.
call closes on December 31st, 2008. The Centre for International Mobility CIMO invites applications from Russian and Ukrainian postgraduate students for participation in the 13th Winter School organized during 23 - 29 March 2009 at Tvärminne zoological station of the University of Helsinki (http://www.helsinki.fi/ml/tvea). The goal of the Winter School is to enhance the mobility of young researchers and postgraduate students between Finland and the participating countries and to increase the cooperation of the universities. Successful participants invited to Finland after the Winter School by Finnish research teams will be offered a scholarship by CIMO for periods of varied duration. The 13th CIMO Winter School is multidisciplinary - not for a particular, narrow field of science, but rather for a scientific topic. This time, the school focuses on biomolecules regulating health and disease embracing topics from neuroscience, biochemistry, clinical microbiology, endocrinology and cognitive psychology. Leading Finnish experts will discuss the roles of biomolecules in pain, addiction and cellular signaling, as well as in diabetes. Applications from all related fields, such as molecular and cell biology, physiology, biophysics, biology, psychology, medicine and biomedicine, etc. are welcome. The school tends to stimulate active participation and discussion. The untraditional working method is especially developed for the Winter School and it aims at enhancing the strength of participants’ own personal expertise, problem-solving capabilities, scientific presentation skills and creative mind. 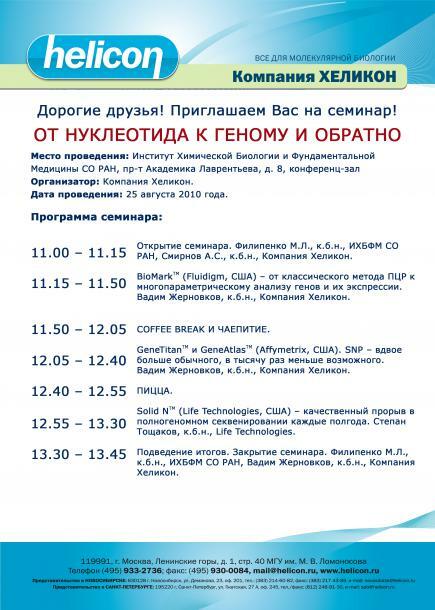 Written applications for participation are welcome from Russian and Ukrainian postgraduate students. The applicants must be citizens of Russia or Ukraine and not over 33 years of age. Applications are not accepted from those who have participated in one of the previous Winter Schools. The application form and instructions can be found on CIMO’s website (www.cimo.fi | In English). The deadline for applications is 24 October 2008. The complete paper versions of applications should reach CIMO by that date. No participation fee is charged from the participants. Accommodation in student halls of residence and meals at course site are covered by CIMO. CIMO will also award the Russian and Ukrainian participants a grant covering roughly the travel costs between their home town and Helsinki.